C﻿hicken tikka masala is all time favorite, not only it is popular in India but served in restaurants around the globe. It is a traditional Indian chicken dish which is full of flavor and color. The word Tikka means pieces or bits and chicken tikka is made of boneless chicken pieces marinated in yogurt and spices, then roasted in tandoor oven to give it a smoky and charred flavor and then added to thick spicy orange color gravy. There are different versions of cooking ﻿chicken tikka ﻿masala but two elements remain common, the chicken chunks are first roasted then cooked in spicy rich gravy. Grilling or roasting the chicken enhances the flavor of the dish. This dish is extremely tasty, easy to make and can be eaten all year round. 1. Wash the chicken well and cut into one inch pieces and place it in a bowl. the grill become hot reduce the heat to medium. 3. 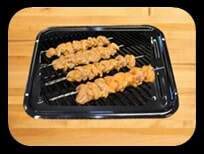 While grill heats thread the chicken pieces on to skewers. 1. Soak the cashews in the hot water for 20 to 30 minutes. in the same food chopper or Blander and grind them. 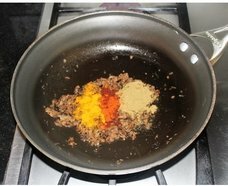 turmeric powder and mix with the onions and fry for few seconds. 7. Add tomato cashew puree mix and yogurt to the onion masala. With the tomato puree and yogurt onion masala become watery turn the heat high for 2 to 3 minutes, so that water evaporates quickly. Frequently keep stirring the onion masala, turn the heat down to medium. 8. In about 5 to 6 minutes tomato puree and onion will blend together. 11. 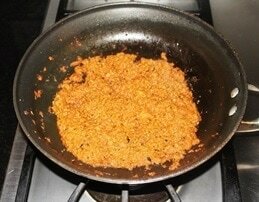 Add grated ginger, chopped green chilies, garam masala and mix. ​ gravy and mix it and cook for another 5 minutes. desired consistency of gravy. Turn the stove off. barbecue. You could also sauté chicken in fry pan. 3. Tandoori chicken masala can be purchased from any Indian grocery store. 4. 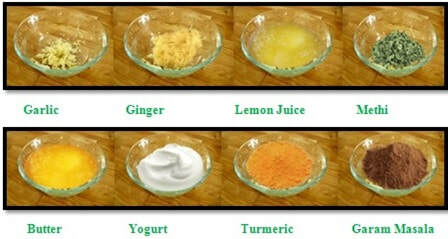 Hung yogurt is thick yogurt which is good for marinating. If you do not have thick yogurt, take plain yogurt, line a strainer with a cloth or a kitchen towel, put the strainer inside a mixing bowl. The bottom of the strainer must be suspended at least 1 inch above the bottom of the mixing bowl. Pour the yogurt in the strainer and place it in the refrigerator and leave it for 2 hours or until all the liquid has drips out of the cloth into the bowl. Scoop out the yogurt and it is ready to be used.